The door to the front of the Mayweather Boxing Club is guarded by several comically huge men, seated on folding chairs. Perhaps 50 people are hanging out in front of the gym with no real purpose other than to catch a glimpse of the world's greatest fighter. In the vestibule, the televisions are tuned to an NCAA basketball tournament game, though none of the 15 or 20 people scattered throughout seem to be paying it too much mind. Inside the gym, maybe another hundred or so spectators line the walls, an eclectic mix of businessmen in suits, young women in nightclub dresses and men in shorts and t-shirts. Floyd Mayweather Jr. stalks around the ring, preparing to begin sparring. He bumps knuckles with a familiar face and then bounds up the steps as a group of his team members begin pounding on the mat, a sure sign that sparring is about to commence. He's preparing to face Manny Pacquiao in the latest incarnation of the Fight of the Century, which will be held May 2 at the MGM Grand in Las Vegas. Yet, everything is surprisingly normal, no different for a Pacquiao fight as it was for his bouts with Marcos Maidana. Floyd Mayweather Sr. is once again training his son. He's completely at ease preparing his son in this very public manner. The only concession to the large crowd is when the bodyguards, who are all wearing earpieces and microphones, circle the ring and demand that all cameras and cell phones be put away so no one tapes the sparring and ships it off to Pacquiao's camp. No one is about to argue with these guys, the largest of whom, Alfonso Redic, is 7-foot-1 and 430 pounds. All cell phones and cameras very quickly disappear and Mayweather begins his work, confident that no one he doesn't want to see what he's working on will see it. "We ain't worried 'bout nothing," Mayweather Sr. says later. "No secrets here. Anybody can watch us work." All right, not exactly anybody can get in, but it's not clear how one person passes muster and enters and another is turned away, forced to stand in the parking lot of the strip mall in Las Vegas' tiny Chinatown district. The very next day in Hollywood, a much different scene plays out. Oh, there are plenty of people standing idly by in the parking lot, a lot of fans and, every day, Filipino media. Hours before Pacquiao's arrival, a reporter easily slips inside and banters with trainer Freddie Roach, his assistants and fighters Glen Tapia, Ruslan Provodnikov and Denis Lebedev. Suddenly, Pacquiao's brother, Bobby, himself a one-time fighter, strolls into the gym and things change. "He's here! He's here," someone shrieks, signifying Pacquiao's arrival. Pacquiao strolls in casually and greets a visitor, then heads to his locker room where he does an interview. When it's complete, Pacquiao loosens up for a few minutes. When Pacquiao is ready to spar, Roach has the gym cleared. All but a handful of Pacquiao's most trusted confidantes, including his brother, Bobby; adviser Michael Koncz; conditioning coach Justin Fortune; assistant trainer and lifelong friend Buboy Fernandez and publicist Fred Sternburg are shooed out. This is very much unlike Pacquiao, but Roach said he prefers it this way. "Manny's always been very open and so forth," Roach said. "But this is such a big fight and getting the game plan right is so important. I felt it's critical we fight the right fight and to tell you the truth, it's been a lot better. Manny's getting a lot of great work in and I think it's been his best camp in a while because of it. "There aren't a lot of people talking to him and interrupting and so forth, giving their opinion. 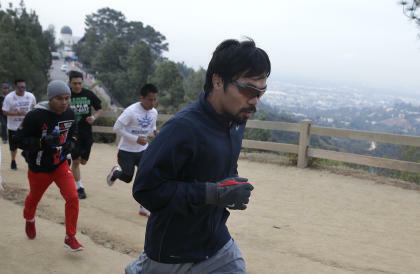 Manny is getting his work done." Pacquiao didn't spar at Wild Card as scheduled several days last week, leading to a mini-furor among those who follow him most closely. Roach, though, said it's difficult for Pacquiao to do what he needs to do to prepare for the fight of his life, given the attention and the demands. Two weeks ago, Pacquiao shut down all interviews except for his April 15 media day until fight week. And Roach moved his sparring over to Fortune's gym, away from the prying eyes of the omnipresent Filipino media. Mayweather refers to his work in the gym as "just another day at the office, no different" than any others. But it's clearly different for Roach and Pacquiao. Roach, though, said it's not a sign of fear or weakness. "I don't give a [expletive] what they're doing," Roach said of Mayweather's camp. "I care about what we're doing and to be honest, I wish I'd done this a long time ago and taken more control [over who gets into the gym when Pacquiao spars]. It's so much better it's not even funny. He's concentrating so much more on what we have to do and understanding the plan." So the boxers go through their paces in very different ways. Mayweather puts on a show for the crowd and displays no concern about the enormity of the event for which he's preparing. Pacquiao gives a nod to its significance by closing down his camp so he can devote himself completely to the task at hand. At the end of the day, though, the two rival trainers, Mayweather Sr. and Roach, agree on one thing: None of this matters comes May 2. Mayweather Sr. is supremely confident of victory, as always, and predicts a dominating victory by his son. "Man, let me tell you something," he says. "Freddie Roach, he's the joke coach, but I ain't got a thing to say. Let him talk and do what he wants to do. I ain't scared. You know why? Guess what? There ain't no threat in front of my son. That's why I'm not worried about nothing." Roach has used the attention he's getting since Pacquiao has stopped doing interviews to talk about the fight and pick on the Mayweathers. He's referred to Floyd Jr. as "Flipper" once video came out of Mayweather swimming while getting prepared. 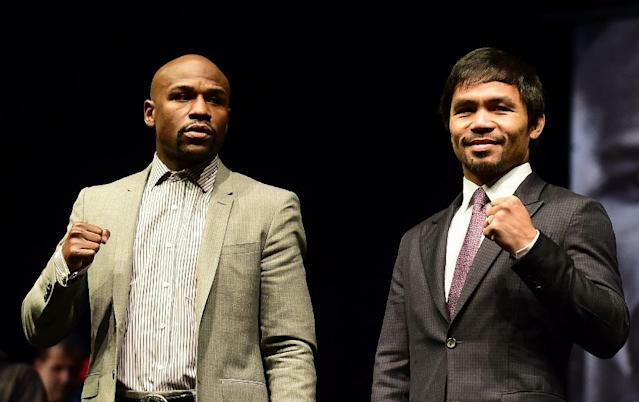 But he has great respect for Mayweather Jr. and knows it's going to take a near-perfect effort for Pacquiao to win. "Executing the plan is so important in this fight," Roach said. "I don't want to take any chances, and we're definitely better off not having Manny getting distracted by all the people hanging out in the gym. It's all about boxing and the plan and that's what we're here to do at the end of the day."